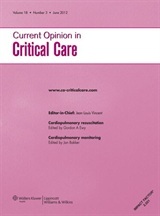 The June 2012 issue of Current Opinion in Critical Care has a retraction that might have been a rather mundane case of plagiarism but for the remarkably intertwined relationships of the authors of the publications involved. The Journal retracts the article ‘Pulmonary/Renal Interaction’ by Ricci and Ronco . Significant similarities were found between the [Zaccaria] Ricci and [Claudio] Ronco article and an article by Ko et al in Blood Purification. The Journal recognises that Ricci and Ronco cited the Ko et al paper and notes the authors’ apologies for submitting the wrong version of their article. The Ricci and Ronco paper has been cited nine times, according to Thomson Scientific’s Web of Knowledge, while the Ko et al has been cited 13. For those keeping score at home: The editors of a journal invite two of their own editorial board members (one of whom edits a marginally competing journal) to write a review article which turns out to plagiarize from a paper in the editor’s own journal! Now, if anyone should know the rules of the game here, it’s Ronco. Would people like to take this eyetest? (It is not an advert for a company). This is awful! Ronco, Tetta, and Ricci are serial duplicators! They must be working really hard to pad their publication lists… where is a cop when you need one? Waitaminnit… didn’t Ronco produce the Veg-a-matic? Retraction. “Acute heart failure treatment: traditional and new drugs” by Gheorghiade M, Palazzuoli A, Ronco C. Contrib Nephrol,2010;165;112-128. Retraction of * Gheorghiade M, Palazzuoli A, Ronco C. Contrib Nephrol. 2010;165:112-28. But it could be worse, where two editors of a journal jointly wrote two papers for their own journal, mostly plagiarized from other sources, like Wikipedia, but adding errors and subtracting citations. When complaints arrived to the publisher a year ago the editors quietly reworked the (on-line) papers by Feb 2012, with no retraction, no apology, no notification to the complainants. See Wiley Cover-Up @ Deep Climate. By that standard, Current Opinion in Critical Care did well. So Ronco is the editor of Blood Purification AND the associate editor of Blood Purification? He reports to himself? I’ve reread this about four times. Am I reading it right? Errr…I think there is something amiss in the section on the various connections. Ronco is Editor of Blood Purification and on the Editorial Board of COCC. Ricci is on the Editorial Board of COCC and Associate Editor for Blood Purification. The part describing these relationships is a bit crooked and suggests Ronco is both Editor and Associate Editor for Blood Purification. Aaarrgh! I press “post comment” at the same time you make the correction! You could not MAKE this stuff up–if you did someone would accuse you of writing an absurdist play. You do a great service my bringing this to public attention–and bring a little humor into our lives, too, with this one. Thank you, Fernando Pessoa, for those very amusing links! The initial view on the web site is not at all promising, but I’m so glad I gave it a chance and scrolled down. One laugh after another! Identical titles and abstracts in some instances, slight shuffling of words in other instances! It has long been known that nobody reads papers listed in a CV, just titles and journal names, but these guys are betting that nobody reads even the titles, which are way too similar to escape detection. We live in the age of merely counting publications as the measure of accomplishment. Thank you for introducing me to this web site. There are many ways to seach it. 3 ways I use. Enter surname, plus or minus initial, or place. Better just first initial, you don’t want t narrow the saerch down too much. ALL ( Show ) Press Show, a list appears, sometimes a bit slow. copy the Type/journal code e.g. then press the search button. Press the numbers in the ID column to generate a side-by-side comparsion. Don’t forget to scroll to the bottom of the page. The overlap is often more than the blue highlights. Sometimes the highly overlapping publications (they are all overlapping as that is how the computer finds them) are sanctioned, they can be mistakes, for example the wrong abstract was onserted, but often they are highly overlapping and do to fulfil the criteria for accetable secondary publication. Some editors are against changing anything. They believe that it would be “rewriting history”. We had to do that to overturn the dogmas of the Ancients. I believe that with not that much work on the part of editors the sceintific record could be made much sharper. Sorry to disappoint. I think it started in 2007 and must have been in the works for a few years before that. The fact that abstracts are meant to be all the major points seems to escape editors too. They play the game of finding that the toenail on the left small toe is different, or warn you that you are making accusations. By definition the pairs are overlapping becuase that is how they are found. The rest is for the journal editors to do. What I often find is that the editors protest too much. Guess what? They often have their own cache of highly overlapping publications. Love the Chinatown reference – assuming that’s what you were going for in the tagline. If you ever get a retraction of a longevity-related paper, I might suggest one of my favorite Roy Batty quotes. “…like tears in the rain…” you mean? Clin J Am Soc Nephrol. 2008 Mar;3(2):531-44. Epub 2008 Jan 30. Potential interventions in sepsis-related acute kidney injury. Ronco C, Kellum JA, Bellomo R, House AA. Department of Nephrology, St. Bortolo Hospital, International Renal Research Institute Vicenza, Vicenza, Italy. My question is how original are those below? The implications and management of septic acute kidney injury. Ricci Z, Polito A, Polito A, Ronco C.
Nat Rev Nephrol. 2011 Apr;7(4):218-25. Epub 2011 Mar 1. Review. Rationale of extracorporeal removal of endotoxin in sepsis: theory, timing and technique. Ronco C, Piccinni P, Kellum J.
Contrib Nephrol. 2010;167:25-34. Epub 2010 Jun 1. Review. Fluid management in septic acute kidney injury and cardiorenal syndromes. Bellomo R, Prowle JR, Echeverri JE, Ligabo V, Ronco C.
Contrib Nephrol. 2010;165:206-18. Epub 2010 Apr 20. Pathogenesis of acute kidney injury during sepsis. Curr Drug Targets. 2009 Dec;10(12):1179-83. Blood Purif. 2008;26(1):30-5. Epub 2008 Jan 10. Extracorporeal blood purification in sepsis and sepsis-related acute kidney injury. Curr Opin Crit Care. 2007 Dec;13(6):662-7. Extracorporal blood purification: more than diffusion and convection. Does this help?